Colour: Dark golden with orange and reddy tints. Nose: A rich deep and dark winter dram that welcomes you with big open arms for a hug (just like my mate Tom). There’s christmas cake and orange tang marmalade, with enough smokey notes (from the casks) to make you feel that you’re sitting by the fireside in a room of old oak and leather furniture. At 48% abv it’s easy on your nostrils. Palate: Thick, full and velvety smooth, coats your whole palate really well. There’s those thick winter stewed fruits and marmalade that you found on the nose. You’d think that the sherry may be too sweet, but the tannins from the wood temper it perfectly so that it’s not overly sweet, it’s well balanced. After a while a pinch of spices and cinnamon come through keeping your palate on it’s toes. There’s integrated oak notes, but none that dominate at all which helps the dram not feel too old. Finish: Smooth, long and gently warming on your chest, just what you want. A finish that just gently peters out to a balanced end… no sour wood tannins found here, which pleases me. Water: Really doesn’t need any. It doesn’t harm things much however, not much change in the nose… and on the palate it brings forward more buttery notes, although makes it a touch thinner – not really a problem but takes away some of the fun maybe. Thoughts: It’s a cracking dram, there’s no two ways about it, I love it. The extra ABV and lack of filtering works wonders and really highlights the qualities of Glengoyne, whilst the age keep it smooth and wonderful. It’s high 90’s in score for me, 97. 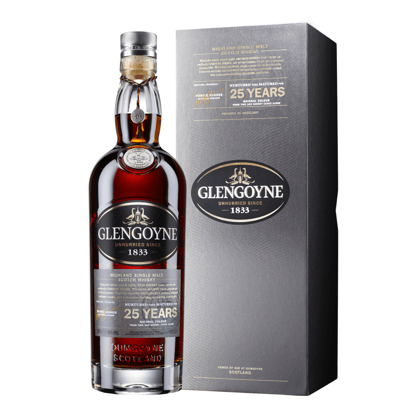 For my short but sweet review of Glengoyne 21yo then head here. The 25yo is fuller, deeper and quite a lot richer in colour than the 21yo, those extra 4 years have added extra depth for sure. I have no idea if colouring is used, but I hope (and suspect) not… a quick Google seems to indicate probably not. Palate-wise the 25yo is thicker, which is much more pleasing in the mouth; the 48% abv here really helps give the full whack of great whisky flavours over the 21yo which must be filtered a little to get it to 43% abv without it going cloudy. The 25yo is also a touch smother than the 21yo which has a slight spicy edge to it. The 21yo has a slight sour tannin finish, not so with the 25yo. 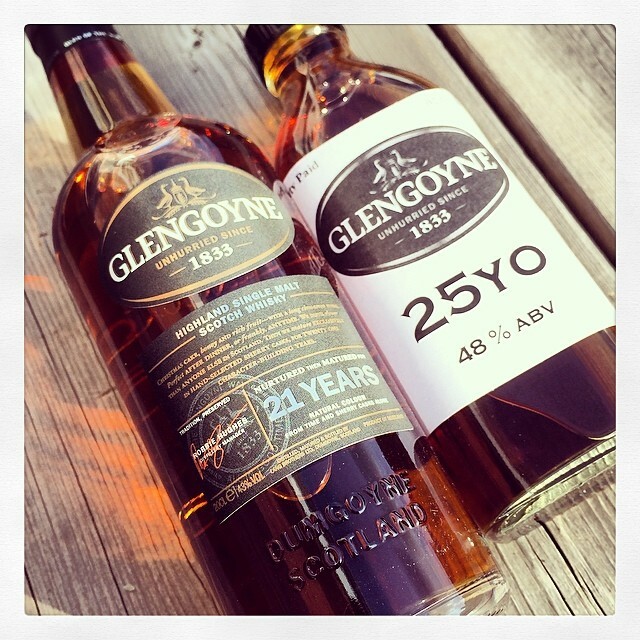 Side by side, the 25yo is clearly a winner for me, Glengoyne should be very proud of this dram joining their range. If I now bring money into the equation then I’m not quite sure if the 25yo is really worth so much extra money over the 21yo… However you are getting a stronger (abv-wise) and older (by 4 years) dram, so that does offset some of the increased costs that’s for sure. That’s right folks, it’s £162.80 more than the 21yo for 4 extra years age and 5% extra ABV, you decide if you think that’s good, bad, or indifferent, but if money’s no worry then the 25yo is the better dram, and I wasn’t expecting to say that in quite such a clear cut way. That’s not to say the 21 is at all bad, it’s not, it’s also an amazingly good dram, and at it’s price point it would seemingly be much better value for money (there’s not 162 quids worth of increased quality between the two). However, on the side of the 25yo, it’s entering the price point of many others on the market of that age, so it’s only to be expected. Thanks to Glengoyne for the sample (the 21yo was mine). This entry was posted in Review, Whisky and tagged Glengoyne. Bookmark the permalink.